How do I connect a start/stop switch? The "start/stop" button gives the driver the option of starting/stopping logging manually. 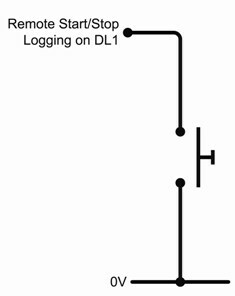 Unlike the sensors that may be connected to the DL1, the start/stop button has four connecting wires, and needs to be connected differently. and Yellow should be connected to "Trig". Step 2: Once the button is properly connected, test that it is working properly. The red LED should illuminate for around 1 second each time the button is pressed.